Developer SRG Properties intends to fill a hole in the studio apartment segment in Downtown Dubai with its 29-storey Marquise Square. The tower’s 237 studios outshadow the bigger units consisting of 59 one-bedroom, 70 two-bedroom and 18 three bedroom apartments. Each studio also comes with its own parking space. The studios account for more than 60 per cent of the total units, a combination uncommon for a prime residential development, admits Fahad Abdulsalam Al Rafi, CEO of SRG Holding Limited. However, he explains that studios are seriously wanting in the area, creating an opportunity for the project. ”We looked at the market and saw that the Burj Khalifa district lacked studios. It only has bigger one-bedroom apartments,” says Al Rafi. Sandwiched between two completed projects behind South Ridge, the building takes the shape of a diamond, which inspired its name. It is designed to give residents optimum views of the Burj Khalifa and the Dubai Canal. The façade not only looks pretty but also intelligently keeps heat out, lowering the cooling requirements of the building. The building will deploy solar panels to heat water, lifts that generate power as they move, LED lights and other sustainability measures. The developer has also been running its own facilities management (FM) division for years. With more than 20 projects in its portfolio, including Al Salam Tower in Tecom, Al Razi Building in Dubai Health Care City and Palacio Tower in Dubai Silicon Oasis, SRG Properties banks on several decades of experience in designing, operating, leasing and selling buildings. Al Rafi says apartment and corridor layouts will be equally efficient, with no wastage of space. Marquise Square features a gym with sauna and steam rooms, a 35-sq-m swimming pool and children’s play area at the podium level, which also houses the 12,000-sq-ft retail complex, which will be geared towards convenience with reasonable rents. Units start at Dh895,000 for a studio, which range from 474-689 sq ft. ”You don’t get an apartment for under Dh1 million in this area,” says Al Rafi. One-bedroom apartments start at around Dh1.3 million with sizes ranging from 749-947 sq ft, while two bedroom apartments start at close to Dh2.2 million with sizes ranging from 1,132-1,641 sq ft. The three-bedroom options range in size from 1,636-2.323 sq ft with prices starting at around Dh3.1 million. 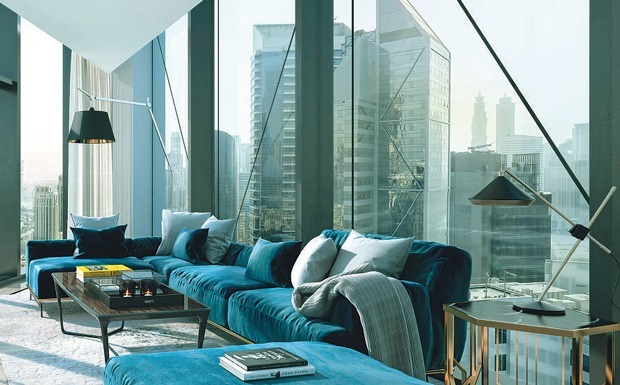 Al Rafi believes the larger apartments would appeal to end users or ”lifestyle buyers”, while the smaller units would attract investors who could lease the studious to people working in the area for between Dh70,000 to Dh100,000 per year. Al Rafi says the project does not fall under the affordable housing segment, targeting the more affluent buyers. ”You would need a higher income of Dh30,000 at least, but this is quite typical in the Dubai International Financial Centre and Downtown area,” says Price. Select Property has sold 67 units from its offices in Dubai, the UK, Singapore and Shanghai during the project’s soft launch. Price says around 60 per cent were lifestyle investors, with the majority of purchasers coming from the GCC. ”We’ve had international interest from the UK as well, and we feel Chinese investors are recognising Dubai as a more stable market moving towards maturity,” says Price. The views have been the building’s main attraction among buyers. Price says the units with a canal view is a good option for those looking for a more cost-effective investment. Buyers, who can resell the unit once they have paid 35 per cent, including the deposit, can also avail of a special payment plan wherein they will pay 30 per cent in two instalments during construction. The second instalment will be in June 2017. The balance is payable upon completion. This is a limited offer valid only this month for a select number of units on the 22nd and 28th floors. The regular payment plan requires 50 per cent to be paid during construction and 50 pre cent upon completion, with three instalments of 15 per cent each covering the construction period. All rights reserved to the initial publisher for Gn property.